There is a very special place near our home that I just discovered. As I was driving on my way to work one morning, a sea of blue that had not been there before caught my eye. 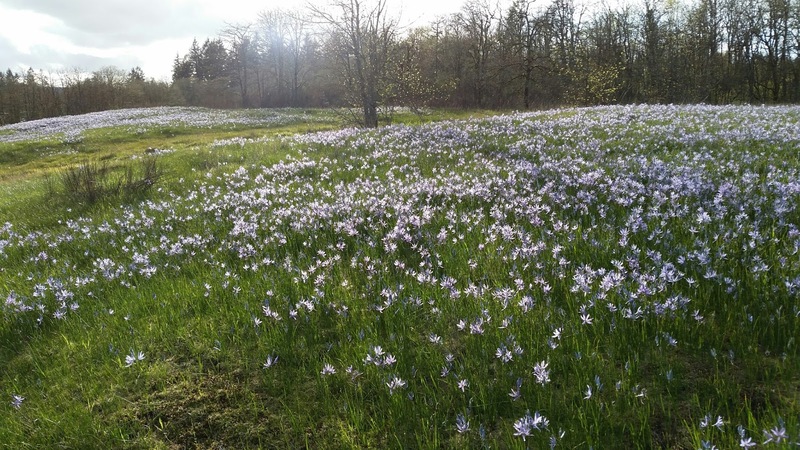 Camas, or Cammasia quamash, a native wildflower highly valued by Native Americans of this region covered an approximately 10-acre bluff down the road from Chickadee Gardens. 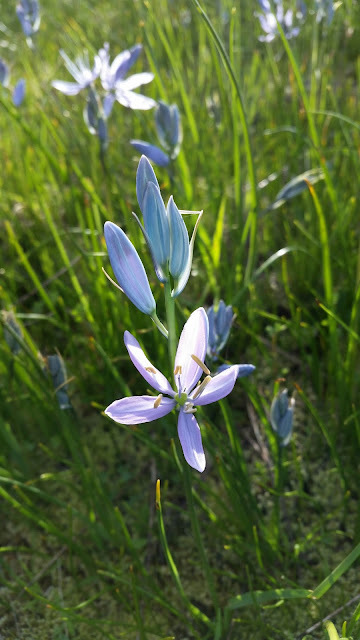 The genus name Camas comes from a Nez Perce word that means sweet, so they were often used as potatoes are, but historically they were roasted in pits. It is said they are sweeter than potatoes. The flowers have ornamental value for home gardeners, too. If you can provide wet winters and dry summers in full sun, this plant could be for you. If you let them die back rather than cut them back they will self-seed around, a wonderful thing indeed for the gardener who wants it to naturalize. The incredible thing about this space is that this whole ecosystem is intact, this has likely never been cultivated land, save for some Native Americans of the region who are reported to have planted fields of camas for food. 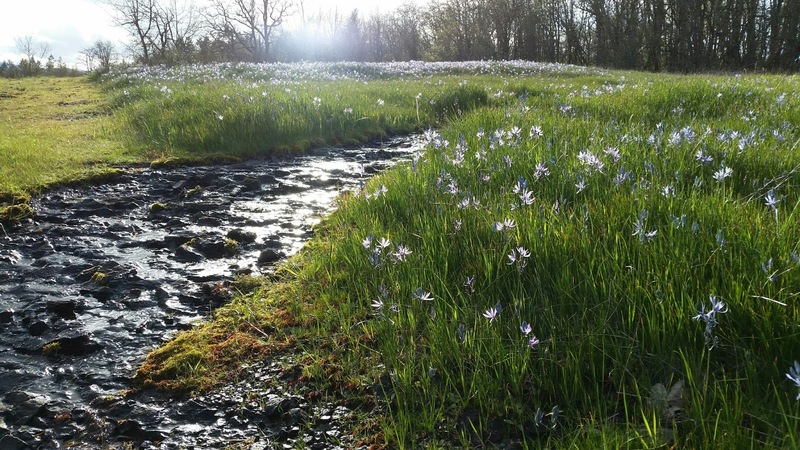 Millions of Camassia quamash once blanketed the Western U.S. In fact, Lewis and Clark wrote about it in their journals: Captains M. Lewis and W. Clark came upon the plant first in western Montana when they met the Shoshoni, which is the tribe to which Sacajawea belonged. They also dined on camas when reaching the Weippe Prairie in central Idaho when they met the Nez Perce after hungrily traipsing down the Lolo Pass headed westward in September 1805. Their journals suggest too much camas makes for a "windy" night. Finally, the Corp of Discovery also came upon the plant as they canoed down the Columbia River. Seems that like salmon, camas was valued as a foodstuff to be traded. There is no mention by the captains of camas when they paddled through the Saint Helens-Scappoose area in early November those 211 years ago. Camas needs wet winter conditions and dry summer, this area's geology is specifically ideal for this plant and many other native species. It is often found in seasonal flood plains. This day several creeks were trickling by. I think drool from my open, stunned mouth also contributed to the flowing waters. I have never seen anything like this save for Bird Creek Meadows near Mount Adams in Washington state, but that was a complex array of many species of wildflowers. I blogged about it in 2013, you can read that post here. There was also this little natural quarry looking area with a few dead cars or train cars, hard to tell. People do come here as you can see by the graffiti. When I stopped it was nearly sunset. The sun's rays back lit the blooms making them appear as stars in a meadow. More than just the camas is significant - there are many Oregon white oak trees and who knows what else is back there. The blooms are pretty much faded by now but for about three weeks I had a strained neck from looking at it every time I drove by. I hope that there is a future for this special place and others like it. Imagine having this, or its equivalent to wherever you live, in your backyard. That would go a long way towards making lives that much richer. Not to mention its historical significance--wow! That's it for this week at Chickadee Gardens. As always, thank you for reading and until next time, happy gardening. How lucky you are! You really picked the right spot to live. That's a glorious view to have close by. I've never even been able to get Cammasia to establish in my garden. So very beautiful, I love Camassias and have just about 1 sq.meter of them in my garden where they are almost flowering. I'm very impressed of your wonderful photos of these fields of Camassias and moreover your story is very interesting too. Thank you! Wow! This must be practically next door. I'll have to find out exactly where before next year. 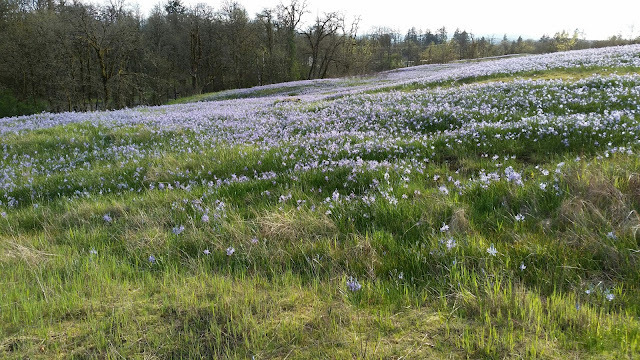 We saw several fields of Camas on our drive in the gorge, but nothing to compare to this. I think I might have ideal conditions but for the gophers.